The thought of owning a well manicured lawn is exciting. But being the one to put in the work to achieve a good looking lawn can be daunting. Have no fear, we have put together an in-depth year round guide to help you get an award winning lawn in no time. 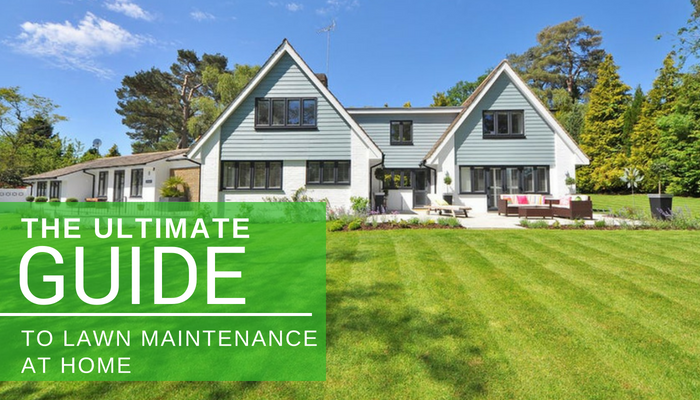 Starting with Summer, here is our ultimate year round guide to lawn maintenance full of tips you can do by yourself at home. Mow. Stick to a consistent routine of mowing your lawn keeping the grass at a length of about 2’-4’ inches. This prevents heat damage and overgrowth of weeds. Cut grass ⅓ of an inch at a time. Water. The easiest way to make sure that the grass gets the water it needs is to install an irrigation. Read about maintaining an irrigation system here. It’s also an option to just use a hose, however this is much less effective than a proper irrigation system. Making sure your grass gets the ideal amount of water will work wonders on the appearance of your lawn. Trim and Prune. If you have hedges, keep them pruned for healthy growth and optimal aesthetics. Blow out the Irrigation System. If you don’t winterize it properly in the fall, you can cause irreparable damage to it that will be very costly to fix. Here is an overview of the steps to take to winterize your irrigation system. A professional landscaper has the knowledge and tools to get this job done quickly. Unplug the timer to avoid power surges. Turn off the main water valve if this is your vacation home. Remove backflow preventer and valves. Add anti-freeze to your pump. Fertilize to Ensure Future Growth. A good time to fertilize is in the middle of the fall season or later in the season. Spready a dry lawn fertilizer over every inch of your lawn. Also a walk-behind drop spreader will ensure you get optimal coverage. A Final Mowing. Trim grass down to 1 1/4 inches at this time, as disease isn’t as likely to affect short grass. Be careful, though, as trimming too short can cut off the food supply from the roots. That’s because grass makes the majority of its food from the upper part of the blade. Do Some Mulching. All you need is a couple of inches of fresh mulch, placed around your shrubbery and trees. Rake. By raking, you are protecting your grass the best you can in preparation for the winter. Aerate and Spread Seed. If you want your lawn to bounce back easily next spring, it’s time to aerate it before it dies and gets brown. You still have time. When you aerate, you break up the dry, compact soil so water and nutrients can get in there. Next, spread seed. By getting the seed in the ground early, it gives the grass a better chance at surviving the winter months and being ready to grow in the fall. Your lawn will thank you by seeding the lawn earlier on. Come spring, you will already have a lush, green lawn in the works. Water Your Lawn. After raking and seeding, it’s time to water the lawn. This gives the seed a head start on growing. It allows the roots to set in the ground and start growing before the worst of winter hits. Remove Dead Landscaping and Debris. It’s time to neaten up your landscaping before winter conditions set in. Get rid of dead annuals, cutting back grasses and perennials. Don’t get too aggressive, just prune back dead branches and remove dried blossoms but leave the stalks (even though they look dead), as these will create new buds in spring. Wrap Shrubs. Pick up some burlap from the home improvement store and use it to gently wrap your shrubs. Without this added protection, heavy snow, ice and winds can dry out your shrubs and cause them to crack. The result in spring is a permanently misshapen and unhealthy shrub, and nobody wants that. If you have small plants, hide them under overturned pots or buckets, and place shredded leaves around baby trees or those that are vulnerable to the cold. Rake Dead Leaves. It’s time to bring out the rakes again and get rid of dead leaves brought on by the cold New England winter. Clearing up dead leaves and other debris from your yard is imperative to achieving a good looking spring lawn. Inspect. Look around for bare patches. Harsh winters can be hard on your lawn especially if it’s been covered in snow. If you find any bare patches, you should apply grass seed and fertilizer. Loosen the surface to about 2 to 4 inches, then level the soil. Spread a mixture of grass seed and fertilizer over the bare spot and pack in the seed. Then water as needed. Aerate. This step is important because it will allow oxygen, water, and nutrients to reach grass roots more easily. The easiest way to aerate your lawn is to hire a local landscaping professional, but if you insist on doing it yourself, renting an aerator is the second best choice. Bring Out Your Plants. New England’s last frost date is mid-April. After this date, it is safe to bring your plants out to soak up some much-needed sun and return to their prior glory. No Replies to "The Ultimate Guide to Lawn Maintenance at Home"